She has a bit of a point - despite all the hype of the NDP surge during the campaign, they did still manage to get a strong majority government with less than half of the popular vote, and the combined popular vote of the two 'right-of-centre' parties could easily have beaten them. Overall, the Wildrose Party ended up with far more seats than the PCs, even though they got 53,000 fewer votes (all this sounds like a set-up for a discussion on proportional voting systems, but I'll save that for later). Though the PC dynasty is ended for now, they certainly aren't lacking in a core voter base, and I wouldn't say they're definitely out of the game just yet. But to those who are lamenting the splitting of the right side of the political spectrum, what's the most efficient way to reunite these two parties? If the right is to take control again, would it be easier to have the PC supporters move over to the Wildrose, or vice versa? 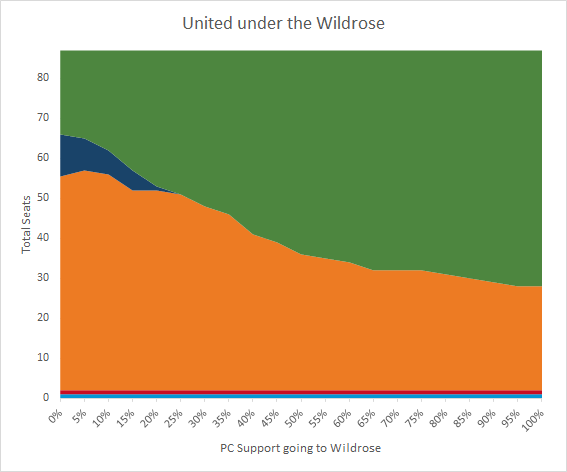 What this is telling us is that if 23.1% of PC supporters in each riding had instead voted Wildrose, there would have been enough to completely eliminate the PC presence in the legislature. 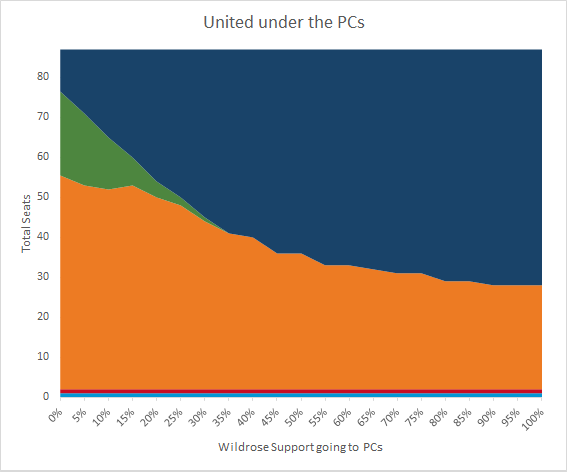 If 35.8% of PC supporters had moved to the Wildrose, it would have been enough to take seats from the NDP and result in a majority of seats. A full reunification of the right would have resulted in 59 total seats, with 26 remaining for the NDP. In both cases, the seats won by the Liberal and Alberta Party MLAs were higher than the combined PC/Wildrose vote, so they're considered immune to this reunification effort. On the other hand, it would have taken 30.3% of Wildrose supporters flocking back to the PCs in order to result in no Wildrose MLAs elected, and a 31.4% defection rate in order for the right to take control of a majority government. Which one of these scenarios is most likely is a more nuanced question. Because of how poorly distributed the PC vote was between ridings, it's much easier for the Wildrose to absorb all of the PC seats (23.1% of PC support is only 95,393 voters across the province, for instance) than it is for the PC to absorb the Wildrose seats. If the goal is to reunite the right and regain control of the legislature, though, it may still be easier for the PCs to try to woo Wildrose voters - 31.4% of the Wildrose support is only 113,072 voters, and would have gotten the right back in power. Overall, this means that a swing one way or another of about 100,000 right-leaning voters could have made all the difference in stopping the NDP from getting elected. Considering that this represents less than 8% of all voters from the last election, the possibility of a resurgence of the Alberta right is certainly not out of the question. The NDP has four years in power now to make good on their promises from the last election and retain their support, otherwise they may be in a bit of trouble during the next election. Breaking promises doesn't necessarily get you in big trouble. The PC's have been breaking promises for 44 years and Alberta kept voting them into power. Main problem is that this assumes the PC's and their base are rightwing. Since Lougheed they've tried to govern from the centre, or at least portray themselves as such, with varying degrees of success. Many PC voters voted PC to keep the Wildrose out of power last election. There would be just as much concern from PC grassroots if the party merged with Wildrose as from the Wildrose grassroots. Which is to say, if such a merger happened, what these hypothetical vote count scenarios don't take into consideration is that corresponding increase in NDP support that would flow from jaded voters from such a merger. Its too simplistic to just add two parties voter totals together and assume the voters would follow the new party. I agree that many PC's would not be comfortable with WildRose ( hence what happened in 2012). Secondly, PC's have had majorities without getting 50% of the vote. Last election they held 61 seats with 44%. I disagree with the premise that just because people voted for a right-leaning party they would vote for the combined PC-WR party. There was serious displeasure in this election with the PC party. If they'd ran an united campaign, the anti-PC vote would not have split and quite possibly resulted in a NDP popular vote majority. A big issue for the NDP is that Alberta is gerrymandered in such a way to give rural voters more power. The NDs were able to win a lot of ridings in Calgary and rural Alberta because of the Wildrose--PC vote split. Some ridings that the NDs won were almost equal between PC and WR--even a slight movement in either direction (e.g. the WR having a more known leader and more time to organize themselves) would have resulted in a different outcome. Keep in mind that the Liberals did not even push the PCs into minority territory in 1993 despite achieving a similar popular vote to what the NDs got in this election. That said, Danielle's comments are ridiculous. Almost 80% of Albertans voted for platforms that are less austere than the one she advocates. Her and her fiscal ideologues are out of touch--the Klein days are not coming back. Also, 52% voting for right leaning parties is hardly much different than 48% for left leaning parties. Take corporate money out of the equation with the reforms that the NDs are proposing, add in 4 years of newcomers to the province, and that result could easily be 50/50 next time, if not tilted in favour of the left. The problem for the left is the disproportionate power of the rural ridings. Interesting analysis from 308 on why the NDP would have won even if the right hadn't been divided. In fact, they would have won more seats. Alberta. In the 2012 election the WRP got 1/3rd of the vote. This seems to be the base support for the WRP, but they failed to get this level of support in the 2015 election because most WRP believed the PC party was stronger party. So some WRP supporters voted PC to keep the NDP from winning, and some voted NDP to keep the PC party from winning. I don't think Alberta is changing. That is an assumption. I predict we are simply transitioning from a PC dynasty to a WRP dynasty. Despite all the problems with the PC party, I am proud that our province was ranked the freest economy in N.A. under their leadership. That will not be the case under the NDP. It is true that the rural ridings are over represented, but it is not true that the City of Calgary and Edmonton are under represented, or that the 'rest of Alberta' is over represented. The fact is that the WRP should nearly sweep the 36 seats outside of the two City regions next election. I am predicting a WRP majority government in 4 years!